Extremely effective - Apek's simple Freeflow Control Device contributes a significant advance in diver safety. In the event of 2nd stage freezing, freeflow can cause catastrophic loss of air. With a simple sliding action the FCD allows a diver to isolate a freeflowing 2nd stage and continue the dive using a secondary air source or alternatively, manually control the air flow allowing a safe ascent to the surface. 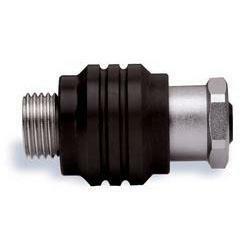 Designed to fit all regulators that use the standard 9/16" UNF hose fitting.